EAHAE International Member: Emma Taylor, UK. I’m an HR professional with 15 years’ experience in creating leadership change as an HR professional within large and medium-sized organisations. 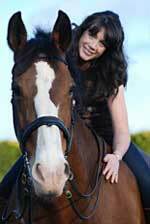 I work with executives and organisations to improve their leadership, confidence and trust using horses. I’ve always lived around horses and they have had a pivotal role in my development. They are are perfect fit for the way I work with their innate understanding of the way we, human beings, operate. We operate in teams, so do they; we look for security and confidence, so do they; we look up to leaders, so do they. At The Leadership Whisperers We passionately pursue conscious leadership in every interaction, creating sustainable behavioural change that transforms people, business and society. Based in Warwickshire, Oxfordshire and Gloucestershire and operating globally, The Leadership Whisperers was founded in November 2014 to promote leaders working in harmony with themselves and each other everywhere. Attracting, developing and retaining talented leaders in today's high performance culture is more challenging and critical to business success than ever before. With increased workload and diminishing resources, the pressure on leaders to inspire and influence becomes more vital. • Leadership with horses workshops - for teams of up to 8 people, tailored to meet client needs. Participants can expect to increase: Courage and confidence, Trust and mutual respect, Power, influence and authenticity, Assertiveness, presence and impact. • Leadership with Horses 6 and 12 month programmes - based on 12 leadership modules that can be combined to create a bespoke programme to meet specific business needs. We have a vision of a world without conflict, where differences are embraced and included and everyone has the skills to live and work in harmony. Our mission is to help leaders and executives develop powerful relationships and communication skills that enable organisations to live and work in harmony. Our values are the driving force behind everything we do. They are values that we continue to stretch into deeper and we encourage our clients to step into them too. We help leaders and executives revitalise their workplace by being more vibrant, compelling and courageous. We work with you to create sustainable behavioural change that transforms leaders and your business.